My daughter has her classroom Christmas party tomorrow at her school and I really wanted to bring in a special holiday treat. 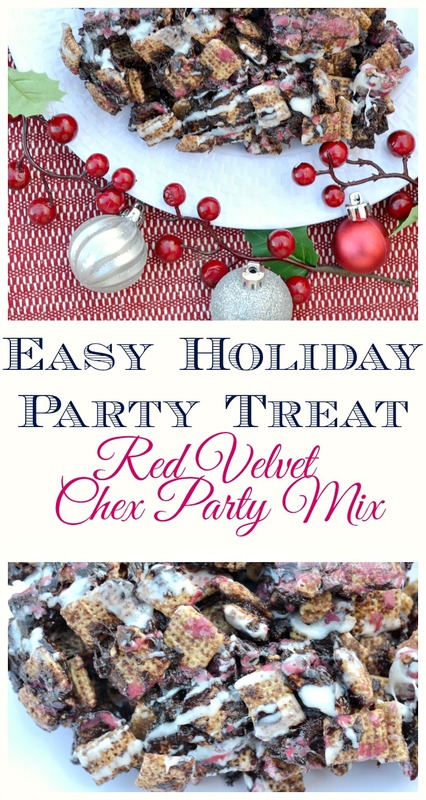 With the time winding down and my children running in all directions, I decided that a easy party treat was in order, which eventually led me to this festive and delicious red velvet Chex party mix! The best part about these type of recipes is that you can make them in large batches and there will be plenty to go around. Plus they are perfect if you have little helpers in the kitchen, they can help with just about every step. So let’s get started with this recipe, shall we! 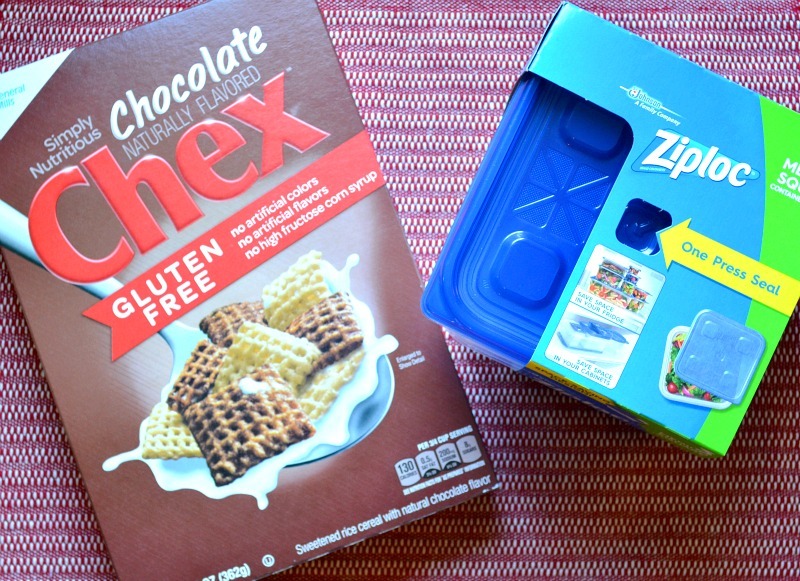 The first thing you will need to do is head to Publix and grab these delicious gluten free chocolate Chex Cereal and Ziploc containers to store your final product. All of the other ingredients you will need are pictured down below. This is where you can ask the kids to join in and help! 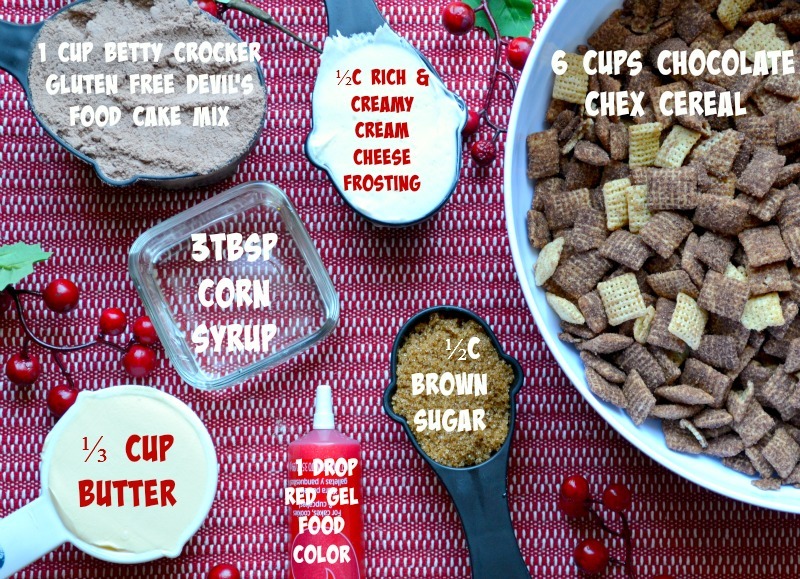 You are going to mix all of the ingredients (except the cream cheese and Chex cereal) into a bowl. Stir lightly and then place into the microwave for two minutes. You will need to pour and coat the Chex cereal with this immediately, it’s going to harden quickly so make sure to be fast with this step! Once the cereal is evenly coated, you are going to want to spread the cereal out on some wax paper and let cool for five minutes. I am not sure where I went wrong on this step, but my chocolate mixture didn’t have that deep red velvet color, even after adding the food coloring. I decided to use half of the cream cheese (melted in the microwave for 30 seconds) and drizzle over the cereal. I used the other half of the cream cheese and added come red food coloring, then drizzled that over the cereal. So now the cereal has a more festive look and that red velvet appearance. 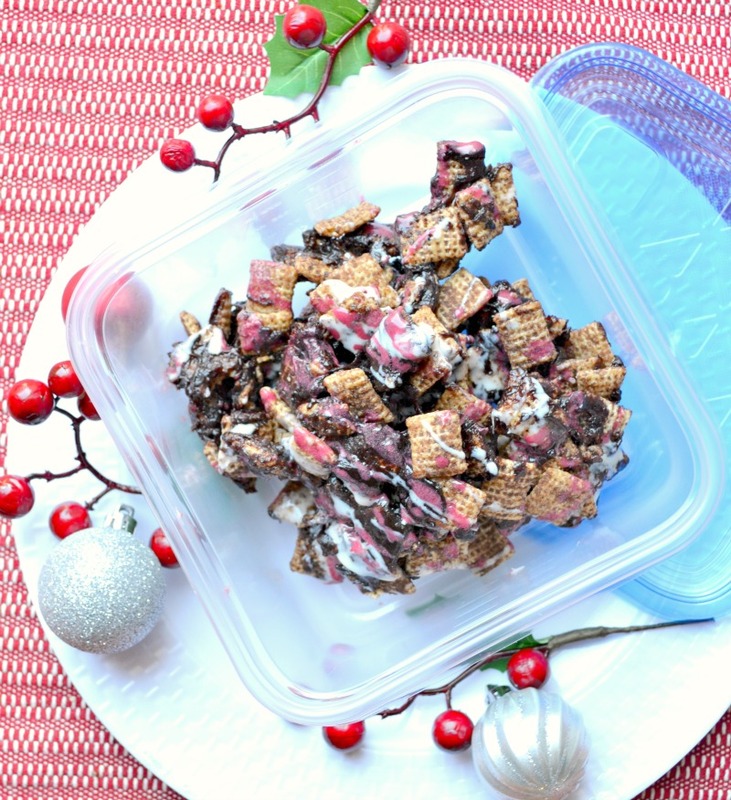 Once your red velvet Chex party mix has completely cooled and hardened, you are ready to store them in your Ziplock containers and bring them to you holiday event! Simple, fun, delicious and an excellent finger food that all of the party guests will love. 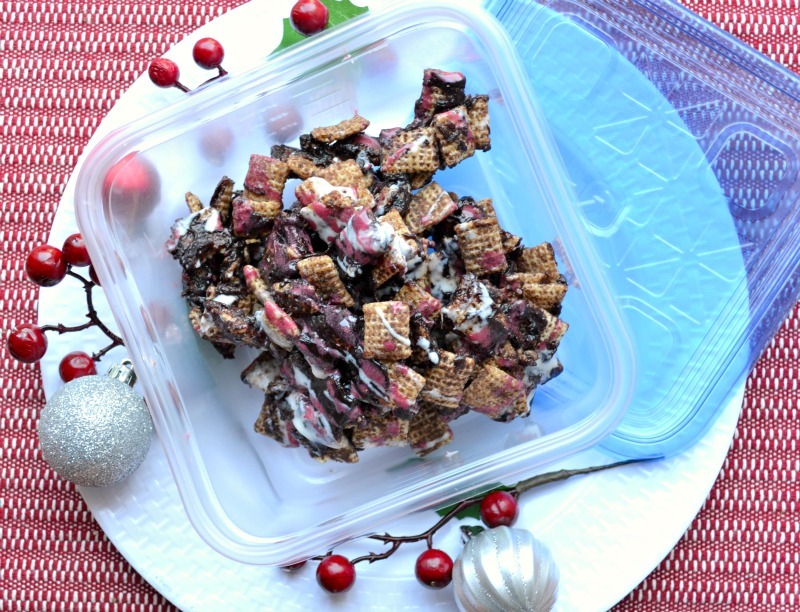 If this particular party mix doesn’t seem like something party guest will enjoy, then stop by the Chex website for many more recipe ideas for the holidays! I would love to try the tiramisu recipe, we love tiramisu at my house!! I’d like to try the Christmas Sugar Cookie Chex Mix! One of my favorite desserts is the red velvet cake. 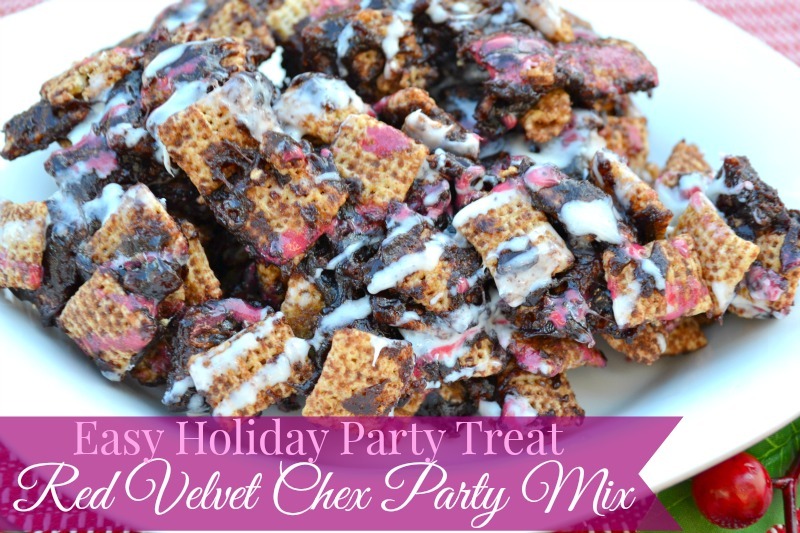 I would love to make the red velvet chex party mix. I would like to try the Tiramisu Chex Mix. I would love to try the peanut butter blossoms chex mix at our holiday party! I’d love to try Red Velvet Chex Party Mix. I’d love to try the Christmas Sugar Cookie Chex Mix! I just love Red velvet things.